It’s hard to imagine a more magical start to the day than standing on your cabin balcony and watching pelicans divebombing the water in search of breakfast. Especially if it’s only 7am, the sky is blue, the sun is shining and your cruise ship is at anchor, surrounded by the craggy cliffs of Isabela Island. Welcome to day two of my oneweek cruise in the Galapagos, a group of islands some 600 miles off the west coast of Ecuador. In this astonishing place you encounter the natural world as it was before homo sapiens evolved to mess with it. Having had the territory to itself for so long, the wildlife here has no fear of humans – and millions of dollars are spent making sure that does not change. This morning we have struck gold. 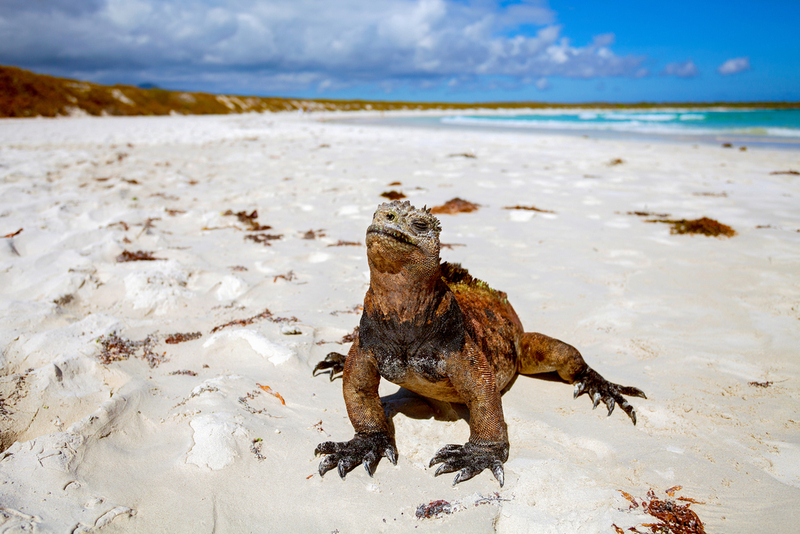 As we cruise around the bay in one of the ship’s inflatable Zodiac boats, we spot Galapagos penguins, flightless cormorants and marine iguanas, all species that have evolved to suit the particular demands of living in these islands. There are sea turtles swimming beneath the boat; comical blue-footed boobies nesting in the cliffs; frigate birds – the males with extraordinary red throat pouches – and even more pelicans. I could have stayed for hours, just wildlife-watching, but one of the joys of a Galapagos cruise in that you can pack a lot of islands into even a short visit. You’ll want to do just that, because the flora and fauna are different on each one, so by lunchtime we were all back on board and heading to our next stop, Fernandina. With room for 100 passengers, Silver Galapagos is not just the largest ship allowed to cruise this archipelago but also the most luxurious. It is owned by cruise line Silversea, a company known for its six-star vessels that visit upmarket hotspots such as Monaco, Portofino and Rome, but which also operates some of the world’s most aristocratic expedition ships. Silver Explorer spends its winters in Antarctica and its summers in the Arctic, while Silver Discoverer sails around Australia and the Pacific but will be making its debut in Asia and the Indian Ocean this winter. And Silver Cloud, one of the company’s classic ships, will also move across to the expedition fleet from November 2017. Once fitted with an ice-strengthened hull and fleet of 18 Zodiacs, she will spend winter 2017/18 in Antarctica. 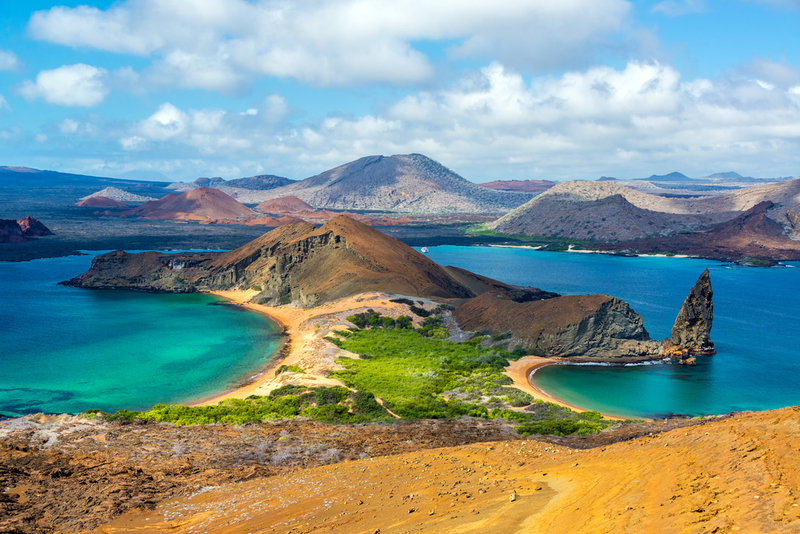 Silver Galapagos has stylish décor, large suites with balconies and butlers, personal but unobtrusive service and – as on all Silversea ships – alcoholic and soft beverages included in the price. The latter is a great touch that encourages conviviality between the different nationalities on board (my shipmates were mostly from the US but there were alsoAustralians, Canadians, Germans, Mexicans and nine Brits). Over seven nights we visited 11 sites on seven islands, going ashore to see the animals that inspired Charles Darwin’s theory of evolution and his epoch-making book, On the Origin of Species. The great naturalist arrived in the Galapagos aboard HMS Beagle in September 1835. The ship’s five year mission was to chart the South American coastline, and Darwin was actually hoping to find an active volcano when he stepped ashore. Instead he merely changed the world, or at the very least our understanding of it. 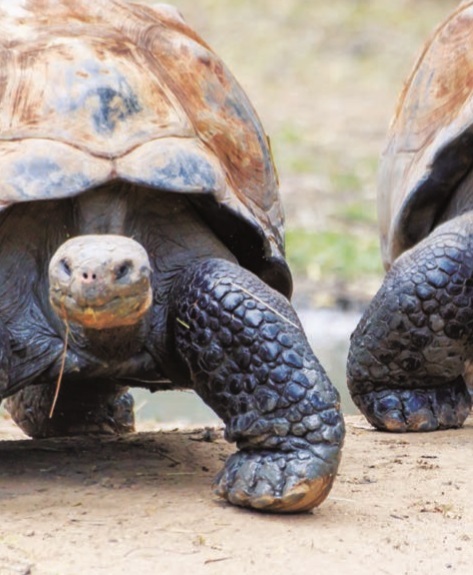 Noticing iguanas that lived in water, and giant tortoises with shells that differed in shape from island to island, Darwin began to see how creatures with a common ancestry could diverge as they adapted to their environment. 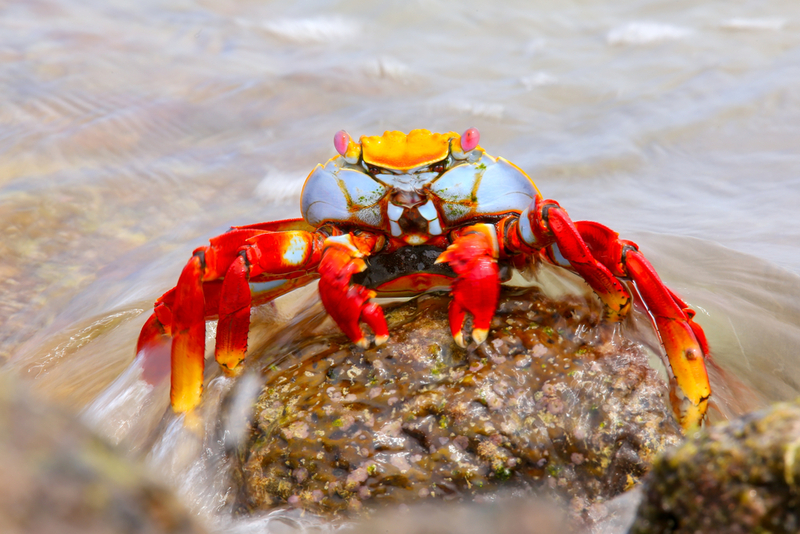 The Galapagos themselves are largely unchanged from Darwin’s day, and the dos and don’ts of visiting this precious habitat were spelled out during a mandatory briefing on the first evening. We could only go ashore with one of the five naturalists who were cruising with us (all were from Ecuador and registered by the Galapagos National Park) and we must always allow them to stay in front. We were to keep our distance from the animals and we had to move carefully so as not to cause them alarm. Equally, those planning to go snorkelling were not to touch any plants or animals in the water (snorkels, masks, flippers and wetsuits are all provided free, and friends who tried it came back with tales of swimming with sea turtles, penguins and sea lions). Landings are made by inflatable Zodiac on to rocks or beaches, so you need a degree of mobility to make this trip. You also need an adventurous spirit because this is a million miles from traditional cruising. Jackets and ties can be left at home, and entertainment means a man with a piano or a lecture about the natural history of the islands. From guest lecturer Dr Toby Musgrave, a British horticulturist, we learned what an inhospitable place this is for plant life. Though each island is different, the Galapagos are generally hot, arid and salty; certainly not the lush green landscapes expected by one lady I spoke to on the two-hour flight from Quito in Ecuador. Like the animals, plants have adapted to their environment. The leather bush, for instance, has vertical leaves to escape the worst of the sun’s heat, while Palo Santo trees “hibernate” in the dry season. Briefed on all the rules and regulations, we set sail from Baltra, the airport island, for a first stop in Bartolomé, a volcanic cone rising out of the sea. Going ashore meant an early start – my alarm went off at 5.45am – and there were 388 steps to the top. Israel, our expedition leader, promised it was well worth the climb, and he was right. The view was simply stunning, although the walk itself was also a great introduction to the islands. 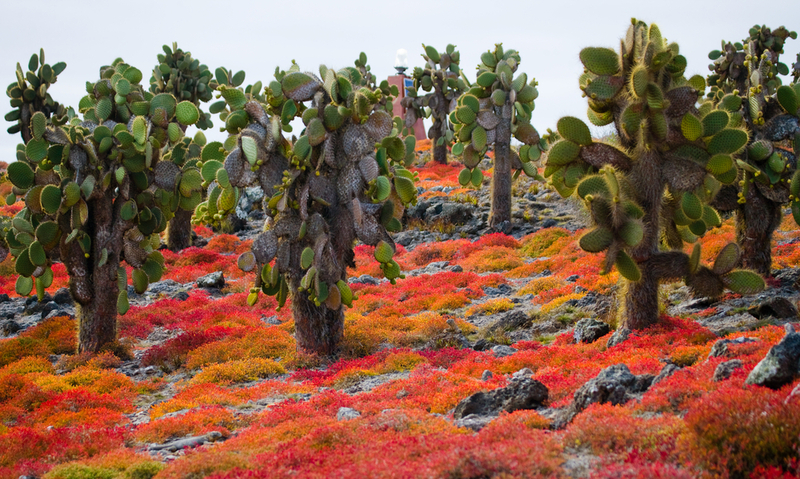 As we hiked through the lava fields, Xavier, the naturalist accompanying my group, explained that the oldest of the Galapagos islands was created about five million years ago; Bartolomé was middle-aged and Fernandina, which we would be visiting next day, was the youngest. None was ever connected to the mainland so most of the animals that live here arrived by sea. It was an extraordinary thought. We were all back on board for lunch, which is served either in the dining room or at the outdoor grill – which was my favourite spot because you could tuck into the soups and salads while enjoying the view. In the evening, it becomes a turf-and-surf restaurant where you cook your meal on hot lava rocks. There’s no charge but reservations are needed. That first afternoon, Silver Galapagos moored off Santiago Island for a hike around the interior to see the finches, said to have been the main inspiration for Darwin’s theories because they have evolved such strikingly different-shaped beaks, depending on whether their main food source is fruit, seeds or insects. Everyone gets excited by the finches, and we saw several of the 13 different species that live in the islands, but the lava lizards were much more fun. 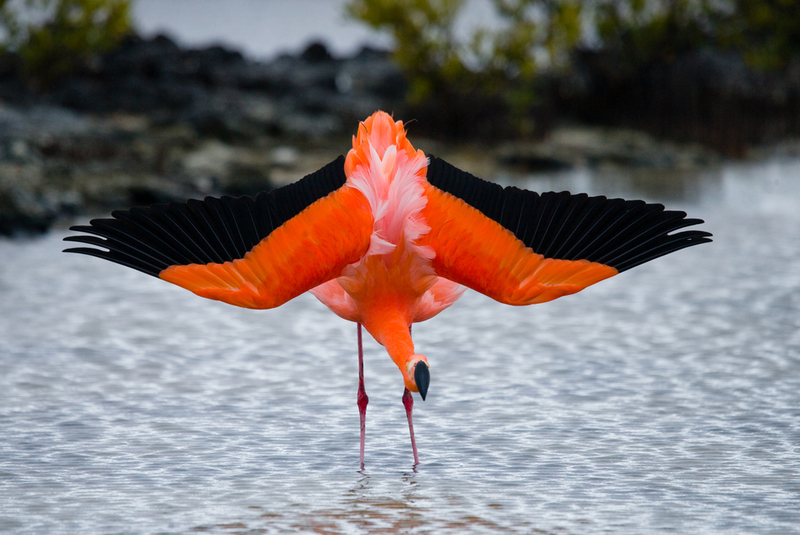 There are seven species in the Galapagos and they communicate using a sequence of push-ups that is different on each island. It means lava lizards from, say, Bartolomé, can’t “talk” to their cousins from Fernandina. Day three was another early start, this time for a hike across Isabela Island to Darwin Lake (named after the great man, though apparently he never went there). On a Zodiac cruise through thick mangroves that afternoon, the finches were upstaged by a baby sea lion that followed the boat, diving in and out of its wake. In Floreana we explored a lava cave before visiting the Post Office – a somewhat grand name for a wooden barrel that has been serving as a mail box since 1793. The idea is that you drop your letters into it, and passengers from other ships collect and handdeliver any with addresses near their homes. Judging by the pile of unclaimed envelopes it is not exactly an efficient service – but imagine the excitement if someone turned up on your doorstep with a long-forgotten missive from the other side of the world. In San Cristobal we saw our first giant tortoises and learned about the breeding programme that saved these noble but ponderous beasts from extinction at the hands of the 19thcentury sailors, who hunted them for food. It was a great morning out but my tortoise highlight came next day in Santa Cruz, where we went into the highlands to see them in the wild. That afternoon’s visit to the busy capital of Puerto Ayora was a culture shock after so many days away from cars, people, shops and restaurants. But in the Galapagos you’re never far from wildlife, and there in the fish market (actually just one stall bearing the day’s catch) was a sea lion, sitting patiently at the feet of one of the vendors, hoping a tasty titbit might fall his way. We were still laughing at the thought of his hopeful gaze as we waited to fly back to mainland Ecuador next day. Spa: reflexology massage, 25 mins, $50; Swedish massage, 30 mins, $80. Includes service charge. One of the UK’s leading cruise experts. Her travels have taken her around the world, from the Arctic to Antarctica and all ports in between. She writes for a number of magazines and the Daily Telegraph, and she is a frequent presenter at cruise shows.